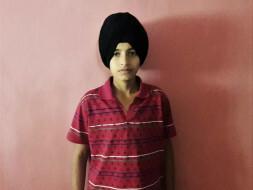 Gagandeep Singh is a 15 year old suffering from Hodgkin's Lymphoma, a type of Blood Cancer. He was first diagnosed with Hodgkin's Lymphoma in 2005 and again in 2012. Both the times he was treated in Postgraduate Institute of Medical Education and Research, Chandigarh where he received chemotherapy. He was in remission when he was diagnosed with Hodgkin's lymphoma for a third time in a short span. This is a very crucial time for Gagandeep as he requires further more chemotherapy followed by an Autologous stem cell transplant. Gagandeep's father S. Jasbir Singh passed away on 28th of march 2010 after a Heart Attack. Subsequently, the family's resources were exhausted in funding the treatments. Gagandeep lives in Tehsil Nowshera, District Rajouri, Jammu and Kashmir. Lend a helping hand to Gagandeep and his mother. Provide them with a Chance to smile again. Donate to the account below. Gagan went to Tata Memorial centre Mumbai for further treatment. 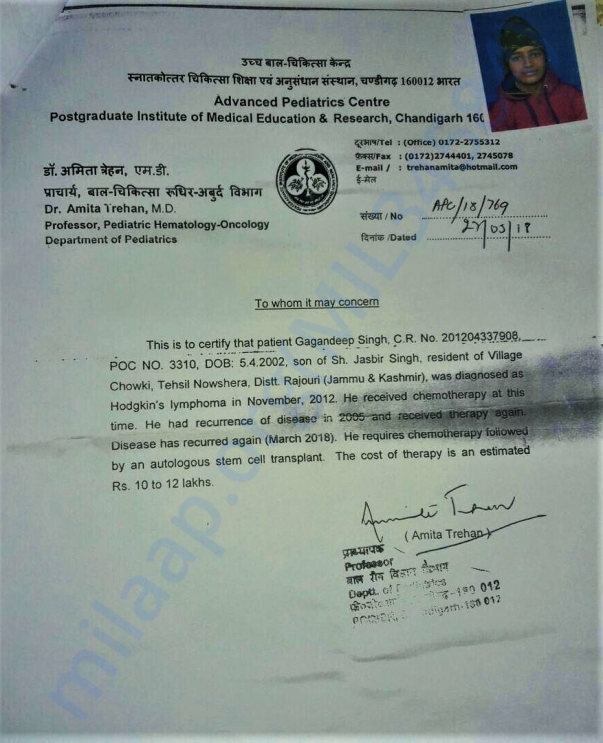 After diagnosis , Tata Memorial centre again sent them back to PGI Chandigarh because of their policies. So Gagan will be in PGI chandigarh. We have spent more than 60 thousands during our visit to Mumbai which is way more than what we have raised through Milaap, but every bit of help counts and we are very thankful to everyone donner for their each rupee. I am uploading one document of his diagnostic test. Please pray for him.